The Roeblings and the Roosevelts are two of the most prestigious families in American history. There was also a connection between the two clans: Robert Roosevelt, Teddy’s uncle, was a trustee in the Brooklyn Bridge Company. Today Robert is less well-known than other Roosevelts, but he was a very prominent figure in Gilded Age America . He was a U.S. 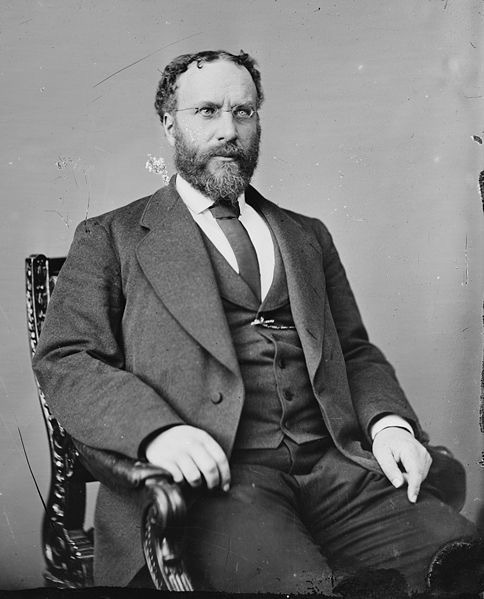 Congressman in the early 1870s and later an alderman and diplomat. Roosevelt was a Tammany Democrat, but also a reformer. He helped take down Boss Tweed’s infamous Ring. Roosevelt joined the trustees in June 1879 when the construction of the bridge was already very much underway. He was an active member of the board who attended meetings and read financial documents with a lawyer’s care. Roosevelt was involved in a very public dispute with the Edgemoor Iron Company over the business’s inability to provide material in a timely manner. He even challenged Washington A. Roebling’s abilities as Chief Engineer, insisting that he file regular reports to the trustees. Roebling dutifully complied. Roosevelt was occasionally too clever for his own good. He once innocently wondered if the extra steel in the bridge might make it more susceptible to collapse. Roebling explained that the added weight provided additional, not less, stability. The Brooklyn Bridge opened to great fanfare in May 1883. When it did however, Robert Roosevelt was not involved in any official capacity; he had very resigned at a trustee’s meeting on June 12, 1882.